A first important distinction among the signs concerns their condition, if they are male or female. From the beginning of spring to the end of summer heat is produced; from the beginning of autumn to the end of winter cold is produced; Aries and Libra initiate the two active qualities, heat and cold, which are considered male qualities. At the summer and winter solstice the dry and the wet qualities originate, which are defined passive and female qualities. According to this premise, all the signs that are in trine to the equinoxes are male. All the signs that are in trine to solstices are female. We can make a second distinction of the signs about their seasonal moment, so we distinguish mutable, solid and bicorporeal signs. The signs initiating the season are called mutable signs (or cardinal), those that strengthen the nature of the season are solid signs (or fixed), the latter are bicorporeal (or mutable), as they have in themselves two bodies and have a share in two natures .The beginning of the season is the beginning of a new way of illumination; this change which happens rapidly, is strengthened by the solid sign and released by the bicorporeal sign. Each of these signs has a specific characteristic which may refer to the physique, the moral, the events. The mutable signs (or cardinal) are also defined tropical (from “Tropê”, change) and are called “public” or “political” because they mark a new way of evident illumination; especially those who are at the equinox (Aries and Libra) are called “component signs” because they compose among them opposite qualities, so they suit interpretation since they have to interpret completely opposite qualities: being in the Northern hemisphere than the Southern one, these signs predispose individuals to interpretations, mathematics, sciences and religion (because religion is a transition, a link between two worlds). The tropical signs which are at the solstices (Cancer and Capricorn) are the “public” and “political” signs for excellence because they are the highest and the lowest; they are “popular” signs, and they are the signs of the judges (because there is nothing higher than courts who judge). Instead the solid signs (or fixed) necessarily indicate the solidity, indicate what does not change, tolerance, the aptitude to continue, to persevere; a benefic planet in solid signs indicates an asset that does not fail, a malefic planet indicates an evil that does not fail, which tends to remain; the planet, benefic or malefic one, in a mutable sign indicates something quite fickle. The bicorporeal sign (or mutable) indicates everything associated with the others; it indicates even art because art is something that is made up of the memory of what has been; the planet in the bicorporeal signs will tend to produce something in a specific moment and another totally different thing in another moment. The solid sign indicates the longest things, the bicorporeal the medium ones, the tropical sign indicates the shortest ones. The signs have no light and have their own nature and they keep it only because the Sun passes through them all the time and, going through them, it illuminates them; then, the signs keep a “luminous memory” and they pass it on us. – The angle of the Imum Coeli (during the day it corresponds to the lower culmination or midnight) is associated with the damp and the time of the winter solstice. It is a male, fire, equinoctial, spring, curved and commander sign. It is Mars house and exaltation of the Sun. Its colours are white and red in various shades. In the body it indicates head and face. As regards the soul Aries represents the brilliant, the distinguished man, the right person to command, the honest person, lover of poetry, which shuns evil, which has a free feel, but it may give an impetuous, daring, changeable, fickle, arrogant, vainglorious, bold, ready and judicious, humorous, talkative, regal, passionate, courageous soul. It indicates the activities of banker, blacksmith, butcher, shepherd, thief, spy, and the places where you work with the fire and where you work jewelry. It is associated with all animals that have hooves, wild or domestic animals, goats, sheeps, rams, deers. 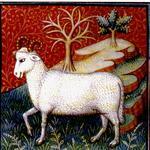 Aries is universally considered the chief, the head. Anatolius of Laodicea shows Aries as the first dodecatemorion of the zodiac, the beginning of months, the head of the zodiac circle and the starting point of the race of the planets. 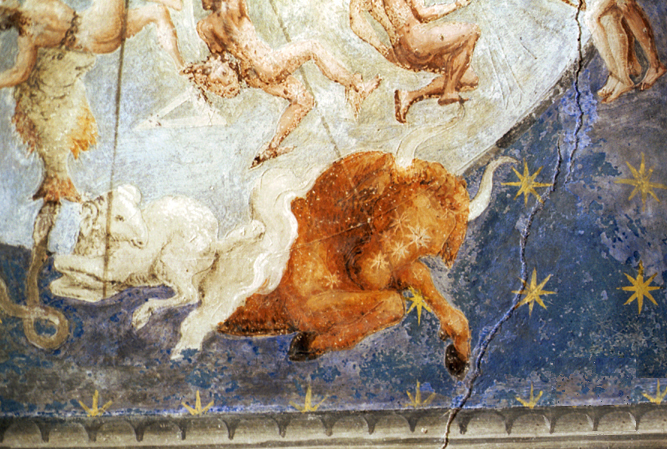 According to Francesco Giuntini the animal of the ram (Aries) maintains the balance of body heat, which appointed bodies are the heart and the liver and it also symbolizes a healthy humoral climate. 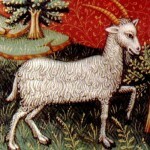 Aries and its fleece in various myths is connected to the rites of renewal and the celebration of the new year when the human sacrifice of the king is replaced by the sacrifice of a ram and where the deep red color becomes gold representing the sense of a royal investiture and signs connected with it had to show the omens of happiness, glory and power of the king. It is a female, earth, solid, spring, curved and commander sign. It is Venus house and exaltation of the Moon. Its colours are white and brown. In the body it indicates neck and throat. As regards the soul Taurus represents the good, the hard-working person, who keeps, the lover of the pleasures and the arts, who is generous, meditative, negligent, liar, passionate, fool. It indicates the activities of builder, craftsman, peasant, farmer, fisherman and the mountain places, lands, orchards, pastures, food warehouses, stables, farms, possessions. Among the plants it is associated with verbena, among the animals with those who become fond of humans, cows, calves, gazelles, elephants. As a spring sign, its heat keeps some dampness, softens the cold and the dryness of the earth signs; for this reason this sign is placed at the beginning of the generative cycle and it is associated with shoots and grafts. 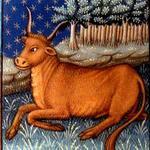 Taurus indicates prodigal and haughty people, those who are devoted to pleasures, delicacy, elegance and entertainment. Like oxen they carry out everything, they are cautious, rich and prolific. It is a male, air, bicorporeal, spring, curved and commander sign. It is Mercury house. Its colours are greenish yellow and pistachio green. In the body it indicates arms and hands. As regards the soul Gemini represents the person who loves to talk, curious, sensible, generous, pure people and those with a good memory, the lovers of the arts, philosophy, astronomy, poetry, proficient in games. It indicates the activities of interpreter, merchant, administrator, mathematician, teacher, musician, dancer, painter, tailor; and also mountains, hills, mounds, the hunting grounds, the river banks. It is associated with tameable birds, gazelles. The characteristics of a person born under the sign of Gemini are: hot and humid temperament, the nature of blood and sweet taste. Not tall, not small, proportioned in body, he has minute limbs and in growing old he preserves a youthful appearance. Because here the planet of Mercury dominates, it presides over speech and intellect, who was born under this sign is driven to know the mysteries of nature and to dedicate himself to activities that require reasoning and expertise. It is a female, water, tropical, summer, upright, commander sign. It is Moon house, exaltation of Jupiter. Its colours are dark grey and dark red. In the body it indicates chest, breasts, ribs, stomach and lungs. As regard the soul Cancer represents the sociable and affectionate temperament, the person with cheerful, changeable, unstable, fickle mood, who loves glory, ostentation, popularity, pleasures, who is also indolent, dull-witted. It indicates the activities in connection with water, such as sailor, fisherman, wanderer, and who stays abroad; places of worship, the cultivated lands, the reed thickets, the rivers and their edges, trees, wells, tanks. It is also associated with desert animals and reptiles. Cancer is the principle of the structure of the elements of the world and how the world is moving, unstable and never equal to itself, it is linked to the events that flow ceaselessly. It is a water, prolific sign indicating a good temperament and everything that fructifies and grows. Among the four tropical signs, Cancer, together with Aries, is the most mutable sign and the fastest one. The domain of the Moon and Venus adds a certain inconsistency. Since the souls descend from the door of Cancer, called the gate of the men, the Cancer and the Moon are considered extremely vital. It is a male, fire, solid, summer, upright and commander sign. It is Sun house. Its colour is reddish white. In the body it represents the heart. As regards the soul Leo represents who is noble, virtuous, just, unchanging, enemy of evil, proud, benevolent, bold, irascible, cruel, quarrelsome, stubborn, forgetful, full of tribulations. It indicates the activities of minter, falconer, squire; desert places, dry lands, caves, mountains, fortresses, high shrines, palaces of kings; among the plants, the trees of large size such as fir trees, those with many leaves and with no fruit and the cyclamen. It is associated with all animals that have claws, lions, wild horses. 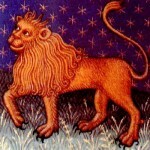 In Leo the summer and the intense heat fortify, in human beings it marks the bile (the strongly heated blood) and prepares to anger and indignation, but also to be firm and steadfast in carrying out their own intentions. The lion is a symbol of royal power and strength, as well as of justice and wisdom. Fire signs are called sovereign and fit to control the domain of the stars of the Sun and Jupiter which rule over the others. Leo specifically has in it the idea of teaching and is the royal sign where power and control are conceived as a guide, so as to lead and show the way. It is a female, earth, bicorporeal, summer, upright and commander sign. It is Mercury house and exaltation of Mercury. Its colour is iridescent whitish yellow. In the body it indicates stomach and bowels. As regards the soul it represents who is fearful, reserved, virtuous, meticulous, generous, well-mannered, reliable, pious, thoughtful, lively, with a good memory, lover of dance and music, inclined to acting. It indicates the activities of loyal and honest administrator, scribe, accountant, secretary, supervisor, who manages assets which are not proper; places of meetings, secretariats and courts, farmyards, fields. It is associated with magpies, crows and ravens, nightingales, sparrows, parrots, large snakes. In September, the summer heat dried up the humidity of the air so the land became barren and fruitless. 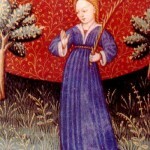 This time is associated with the Blessed Virgin Mary who represents earth and humbleness, cold and chastity, femininity in the sense of compassion and mercy towards sinners, the night condition for her being hidden from the sight of men, and modesty for a conscious discretion in words and gestures. The domain and the exaltation of Mercury incline to kindness, being affectionate, generous, helpful, but also incline to knowledge of some arts related to the Letters. It is a male, air, equinoctial, autumnal, upright and obedient sign. It is Venus house and exaltation of Saturn. Its colour is white shaded with black. In the body it indicates the buttocks. As regards the soul it represents who is virtuous, just, fair, moderate, thoughtful, polite, refined, who is excitable during conversations, with a good memory, lazy, coward, envious, who wants the goods of others. It indicates weights, measures, the craft works; the condition of erratic life, who is waster, musician, singer, surveyor; among plants, vines and olive trees; it also indicates the places of worship, castles, observatories, plains, orchards, cultivated top of the mountains. It is associated with birds and leopards. 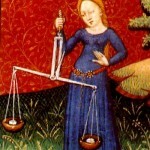 Libra, ruled by Venus, marks the autumn, the variability of the time, the increase of winds and air pathogenic conditions. Libra characterizes the time of year when the daylight hours decrease and the hours of darkness grow rapidly, the exaltation of Saturn (whose domains are opposed to those of the Sun) expresses the sunset of the year (whereas Aries, in which the Sun is exalted, is the sunrise of the year).Libra is a gate of passage and this was the time of year in which there were the consultations of dead people. Moreover, Libra and Aries as equinoctial signs mean the sacred ceremonies, the worship of God and justice. It is a female, water, solid, autumnal, upright and obedient sign. It is Mars house. It has a golden colour. In the body it indicates the genital parts. As regards the soul it represents who is generous, anxious, with a good memory, silly, lazy, vain, brave, proud, rude, cranky, grumpy, deceiver, cunning, malicious, bloodthirsty, traitor, insidious, and who hates his intimates. It indicates the activities of doctor, enchanter, sailor; the high places, the desert places, prisons, places of pain and grief, unhealthy water ponds, vineyards, blackberry bushes, and the artemisia plant. It is associated with aquatic animals, animals with many legs, predatory animals, wasps, scorpions, poisonous insects. 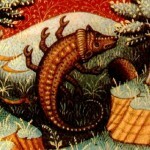 Scorpio is the time of the autumn sowing, the last field ploughing and seed dispersal. Doing these activities while the Moon is in transit in Scorpio will produce a certain abundance of fruits. 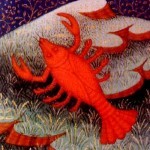 Scorpio is the fertile sign (as well as the other signs of water), fruitful and plenty of seeds. It is a male, fire, bicorporeal, autumn, upright and obedient sign. It is Jupiter house. It has a reddish colour. In the body it indicates thighs and groin. As regards the soul it represents who is noble, just, virtuous, brave, magnanimous, benevolent, conscientious, generous, fond of friendship and glory, who is reticent, trickster, the person interested in afterlife, fond of horses, who is fussy about food, drinks and clothing. It indicates the activities related to horses, inspector, mathematician, who loses his first earnings and then he regains them, who prevails over his enemies; moreover it represents the plain places, churches, arsenals, stables, irrigated orchards, the lemongrass and precious ointments. It is associated with strong animals and with the hooves, pack horses, mules, donkeys, birds, reptiles, and it is also associated with the time of the year when the last migrating birds leave. As for Sagittarius, the blazing heat of Lion is dissolved therefore this constitutes a favourable condition to life, growth and nourishment of the living creatures and plants. 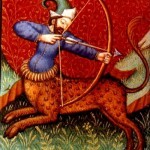 Sagittarius, together with Pisces, indicates what is unstable, diverse and multiform, the person who is an expert in something, who is rather crafty, who acts with cunning and is clever in his own interests. It is a female, earth, tropical, winter, curved and obedient sign. It is Saturn house and exaltation of Mars. Its colours are brown, green and both mixed colours. In the body it indicates the knees. As regards the soul it represents who is moody, anxious, arrogant, irascible, hard-working, cunning, false, who pretends to be honest and sincere, but also who is malicious, liar, forgetful, inconstantt in his opinions but stubborn and attached to his own ideas. It indicates the great activities that are not carried out or who commits serious mistakes; harbour places, castles, ancient cisterns. It is associated with animals living in flocks or crawling animals, goats, lambs, locusts, monkeys. Capricorn is the gate of the gods “because through it the souls return to the seat of their own immortality.” Cancer and Capricorn are called “gates of the Sun”, since solstices mark, in its progress forward and backwards, its movement. It is the time when the sunlight begins to increase even though the sprouts and fruits of the crops and plants are still hidden. Capricorn is the “place of sunset of the world” and means distress and efforts. Its fortune is in land, cattle, stones, food trading, every work involving effort”. It is a male, air, solid, winter, curved and obedient sign. It is Saturn house. Its colours are yellow, sapphire blue and many other colours. In the body it indicates legs, shinbones, tendons, joints. As regards the soul it represents who is chaste, benevolent, shy, sensitive, lazy, slanderer, wicked, inflexible, stubborn, cunning, misanthrope, thrifty, cruel, informer, who betrays honour and truth, and also who is narrow-minded, generous without measure, gourmet, eager for earthly goods. It indicates the activities of trader, glassmaker, jeweller, servant, who is indolent; moreover it indicates places of residence for waterfowls, birds’ nests, taverns, flowing waters, canals and ditches. It is associated with bipeds, vultures, eagles, dark colour waterfowls, beavers, sables, ermines. 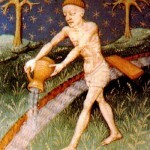 Aquarius opposing the domicile of the Sun is considered contrary to human nature. Being far away from the human temperament it is considered the place where it is possible to purge excesses. 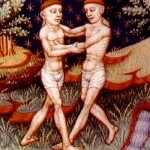 For the domain of Saturn, Aquarius is connected to the modest condition of men, to everything that lasts beyond human expectation. Being born in this sign involves troubles, work and the risk to incur harsh struggles. It ia a female, water, bicorporeal, winter, curved and obedient sign. It is Jupiter house and exaltation of Venus. Its colour is white khaki. In the body it indicates the feet. As regards the soul it represents who is unstable, doubtful, benevolent, generous, delicate, who goes from evil to good, who is sweet, kind, communicative, hospitable, affectionate, servile, silly, faithful, passionate, immodest, prolific, fraudulent, forgetful, those who make mistakes easily. It indicates the activities dealing with people, sailor, who is mediocre in his business; the high places, places where there are the abodes of the saints, the shores of the lakes and barns. Among the plants, fruit trees, medium-sized trees, cotton, sugar, camphor, sandalwood, edible fruits. It is associated with birds, big and small fishes, aquatic carnivores, snakes, scorpions. The sign of Pisces means to leave one’s own country, expatriation, travels, and the feet that allow symbolically man’s ability to move. From the point of view of morals, the foot movement, through an impulse of the will, is the metaphor that denotes the movement of the soul. 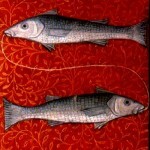 Pisces is connected to divine worship and dreams, to religion, faith, devotion, to the attainment of knowledge through divination. It is a popular sign since it favours actions within society and it is the fundamental condition to trade.